So about a month ago the hubs interviewed for a job back home. But it’s still with Amazon just a different department so that’s freaking awesome! Things are moving slow yet fast. We need to get there the first week of July but the moving company is taking it’s sweet time. So everything might get pushed into the second week of July. We want to drive home to Texas instead of flying. We plan on taking a vacation through California. The boys want to see the beach. What better place than there right?! We want to go to the San Diego Zoo and try to fit Legoland in (SHHHHH! That’ll be a surprise). I can’t wait for Texas. 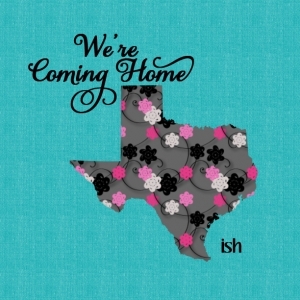 Even though we’re moving 3 hours away from “home” it’s still a whole 30 hours closer! So if your in the DFW area don’t worry…we’ll visit a lot! When I get to Texas I plan on eating as much Mexican Food as I can handle. Drink as many frozen sangria’s as I want. And be in the sun a lot!!! So if your looking for me check in a Mexican restaurant or by a pool.